Hello hello hello! So you all know just how much I am into my health and fitness, forever trying the new things but always sticking by my life rule; balance. 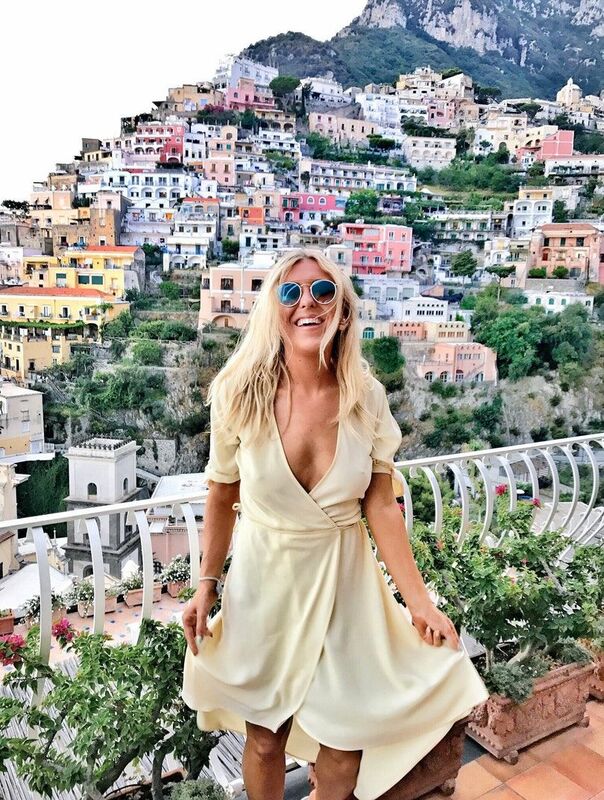 I well and truly believe in balance, that means, eighty percent of the time I will be healthy and clean whilst the other twenty percent, I don't beat myself up for having a pizza (don't forget to read my top health and fitness tips). I don't believe in depriving yourself, if you've read any of my health and fitness posts you'll know that about me! 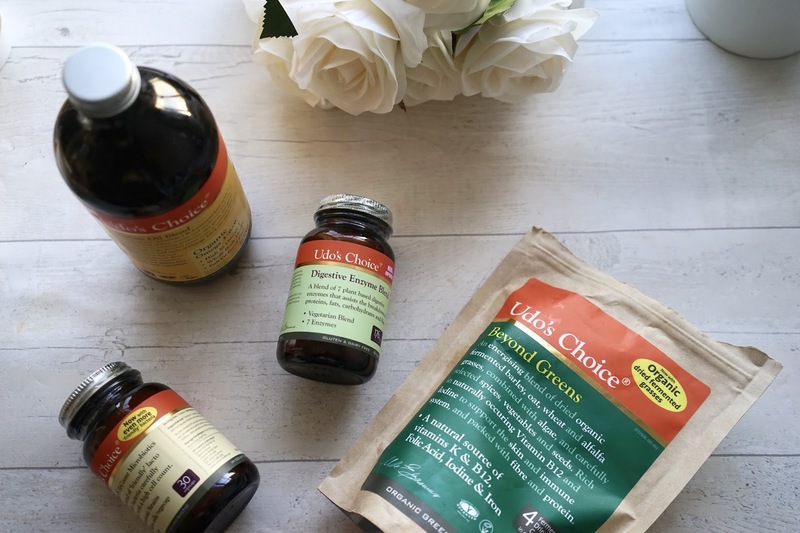 So today, I'm going to be telling you about four new additions to my health cupboard and four new additions which I am loving and using most days. Let's start. 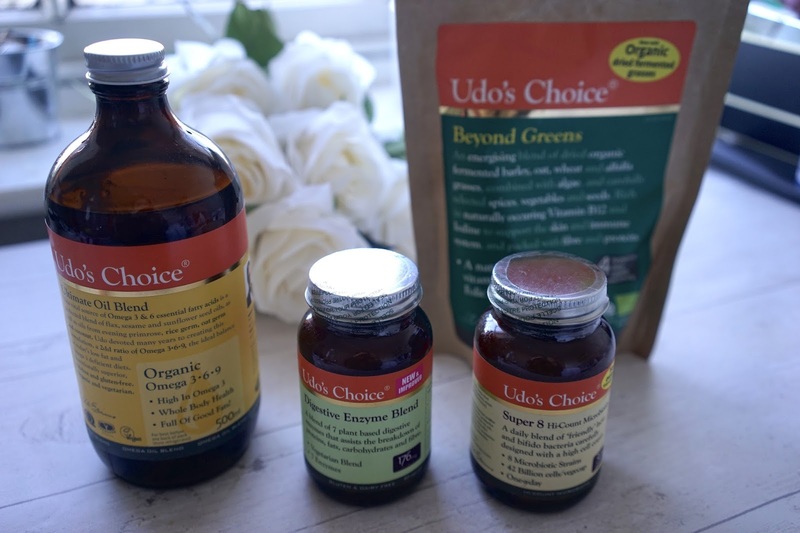 Udo's choice is an incredible natural brand I was recently introduced to, headed up by Udo Erasmus. They sell many products which are all about promoting health and well-being but in easy bottles. I make smoothies and oats every morning and sometimes don't have all the crazy ingredients to put on top and that's where these little babies come in, natural supplements and powders which you can just sprinkle right on top so today, I'm going to talk you through my favourites. Udo’s Choice Ultimate Oil Blend - I've never really taken oil before until now. I've always stuck to my tablets or powders but I couldn't resist starting this. 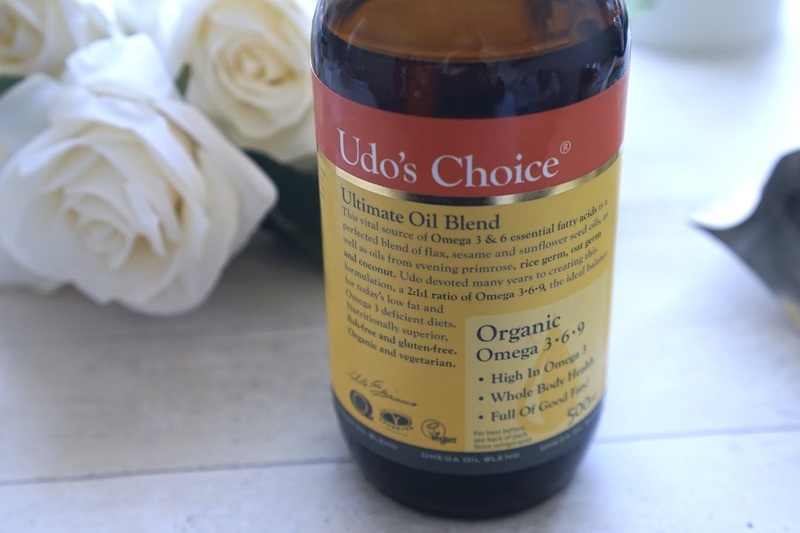 Udo's Choice Ultimate Oil Blend is a vital source of Omega 3 & 6 essential fatty aides and is a blend of flax, sesame and sunflower seed oils as well as oils from evening primrose, rice germ, oat germ and coconut. This oil is basically the perfect ratio of the Omegas giving you the ideal balance. It's also fish free, gluten free, organic and vegetarian. I really don't eat enough fish for getting omega oils is essential for my diet. With this, you simply pour around 3-4 table spoons of it on your food spread throughout the day. It's a really easy way to get all your nutrients without realising you're actually adding anything. Our body can't make certain types of fatty aides so we must source them in food and they only come from plant based foods, such as nuts, seeds and green leafy vegetables, which again is where this oil comes in, as it provides a premium source of unrefined and undamaged flaxseed oil (Omega 3) and sunflower and sesame seed oil (Omega 6). This is specifically designed to make your skin look great too, according to Udo, our skin is a window to our dietary habits - it shows us what's going on in our bodies. If our skin looks dry or tired, then the rest of our body isn't being fed properly either. By supplying your body with the correct fats – Omega 3 and Omega 6, it allows your skin's cell membranes to hold onto water. In this simple action the omega oils work as internal moisturisers, giving you softer more beautiful skin from the inside out. At the same time the hair and nails cells benefit too; hair gains a new lustre and nails become stronger. I add this into my pan whilst making stir fries or pasta sauces every day or even on top of my rice. been added, as well as fibre from flax, sunflower and sesame seeds, plus beneficial bacteria. The grasses (barley, oat, wheat and alfalfa) have been fermented with Lactobacillus plantarum and saccharomyces boulardii; this fermentation process is like pre-digestion along with nutrient enhancement and shelf-life preservation to the formula. The good bacteria help break down the fibrous cell walls of greens and vegetables leading to less chance of indigestion, gas and bloating as well as better bioavailability of nutrients. I know that's very wordy, but basically, a bag full of powdered green goodness which you can sprinkle or add to pretty much anything and again, it doesn't taste too green so doesn't affect the taste of anything. It has some ingredients in there which I'd put in by themselves anyway (spirulina, chlorella, ginger, cinnamon) which are all superfoods so it's easier to just put a scoop of this powder in instead. I spoon this into my smoothie every single morning and sprinkle it on top of my oats too. You know how important I think breakfast is and this ensures you're getting top nutrients with your breakfast. So have I seen a difference after using the oil and the greens formula? I have indeed. What I've noticed most is how seamlessly this fits into my daily routine, pop it in my kitchen cupboard and quickly put a spoonful or three over my food. They don't change the taste of my food and I don't even realise I'm eating it but it's nourishing me from within. My skin hasn't broken out as much, even during hormonal times when it usually does and I'm hoping it's down to the happy skin ingredients inside this bottle. I'm feeling more energetic and always feel confident that I'm filling my body with goodness every morning when I use the powder. It's also worth noting, you get a huge bottle so definitely worth the money! Microbiotics Super 8 - I have really bad issues with bloating so I was really excited to start using these. I cut white supermarket bread out of my diet a long time ago and have felt a little better since, but I still bloat very badly some days and these little tablets aim to solve that. When bad bacteria outweigh the friendly bacteria in our gut, problems can arise such as gas and bloating, it sounds horrible but as a female, I suffer from this really badly depending on what I eat. Super 8 Probiotics provide 42 billion active bacteria in every one-a-day capsule, that’s three times more than that found in a typical microbiotic yoghurt drink. They have been formulated using eight strains of bacteria, this compares with just one to three strains in a typical microbiotic yoghurt drink. The specific strains used in Super 8 Microbiotics have been specially chosen for their value to upper bowel health so if you are suffering from bloating, which makes me feel uncomfortable and not body confident, these may be for you. They're designed to be taken one per day. 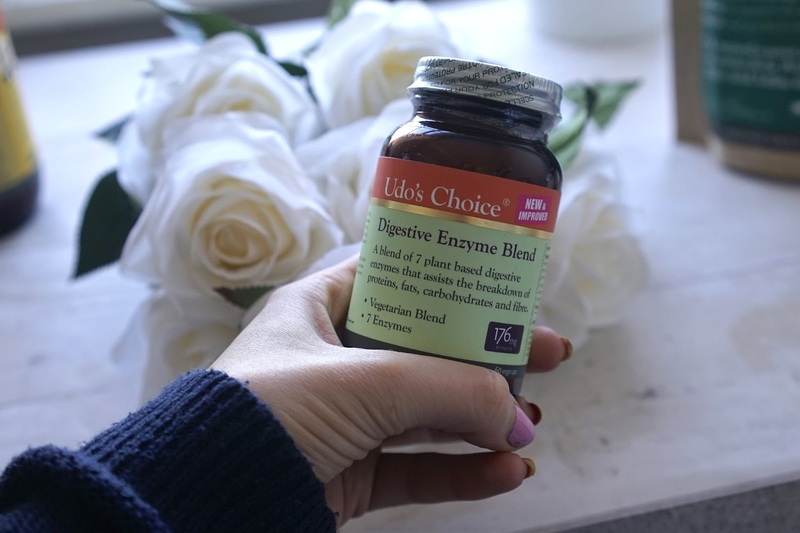 Digestive Enzymes - Last but not least, Udo's Digestive Enzyme Blend is a vegetarian blend of plant based enzymes that have been especially created to replenish enzyme reserves. It basically means that it will help your body digest effectively and give you improved nutrient absorption so you can beat that heavy, I-just-ate-too-much, sluggish after meal feeling. These tablets help to assist the breakdown of proteins, fats, carbohydrates, soluble fibre, starch, milk sugar and complex sugars. So how do I feel about the range? Personally, for me, I am obsessed with the oil and the powder and have been using them every day without fail for about two months now. I feel confident, glowing and always know that my body is being fuelled as best as it can. On days or weeks when I'm feeling a bit grotty, I'll take the Super 8 in order to beat the bloat. I love Udo's and chose to work with them because they're natural, organic and use the highest quality ingredients. 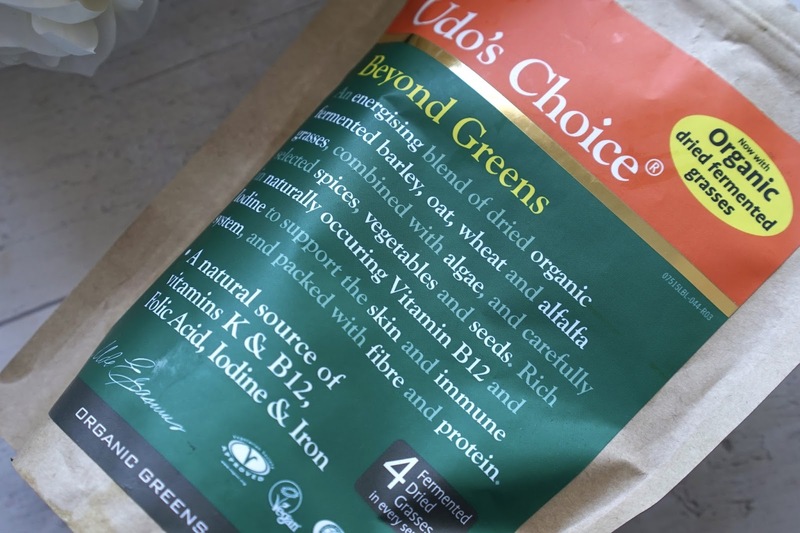 I do not believe in fads, I believe in fuelling and filling my body with natural goodness and that's exactly what Udo's is, it compliments a balanced diet perfectly. You can buy Udo's choice online here. Don't forget, you can read my health and fitness section here. 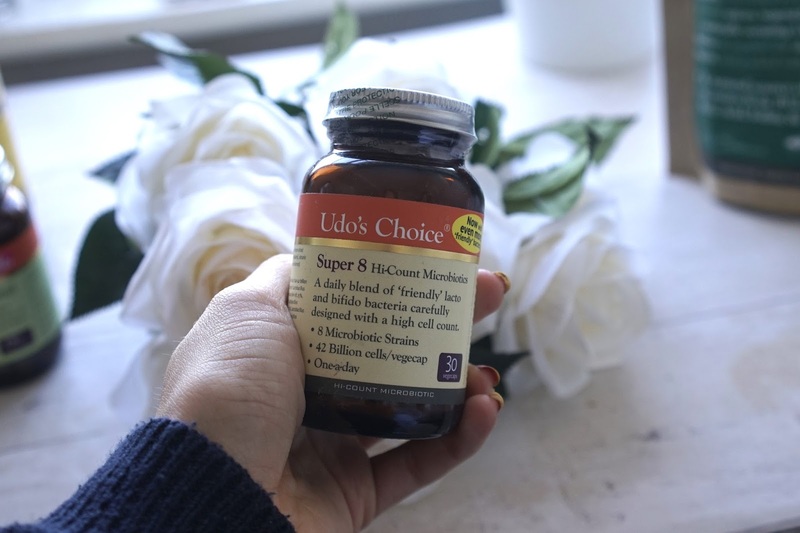 Have you used Udo's choice? Do you like the sound of any of these products? Do you use any superfood powders or tablets? I worked with Udo's on this but as always, it's 100% my honest opinion and I adore the brand.